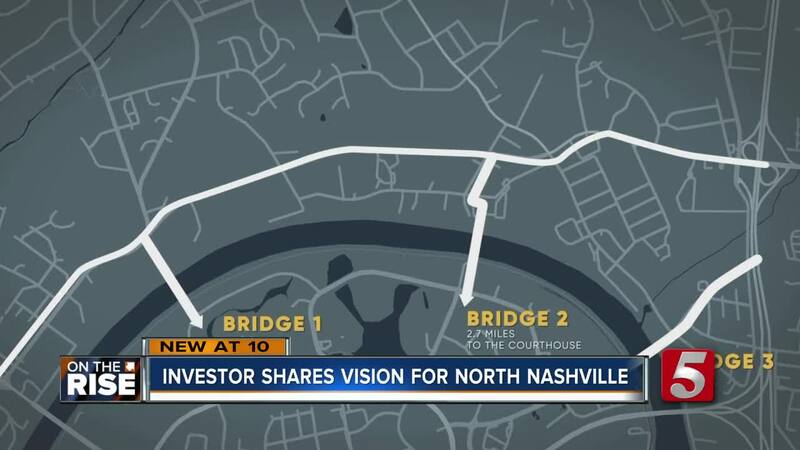 New development could be on the way for North Nashville, if one investor can get resident and city leaders on board with his vision. Edward Ewing says a three mile site along West Trinity Lane between Clarksville Pike and I-24 is perfect for new additions. He said the area has beautiful views of the Cumberland River and downtown skyline, and is only about 2 miles from downtown. Ewing said he is currently retired, but was the managing director of the Carlyle Group in Dallas, Texas before moving to Nashville. He currently owns about 50 acres of land along West Trinity Lane. Ewing said he doesn’t have any specific plans, but anything from office buildings, to condos to retail could be a possibility. He said three signature bridges could connect the area to the other side of the river. New parks and bike trails would also make the area accessible. Ewing said the Cumberland River is an important resource in Nashville that can be enhanced with new development. Ewing estimated as many as 6 million people may call Nashville home in the near future, and plans should start now to turn the riverfront into an area that will benefit the needs of future generations. “A lot of people here go to Atlanta, Chicago and New York to shop because of what is not here,” said Ewing. Ewing hosted a community meeting last week at the Church of God Sanctified building on West Trinity Lane. He included city leaders, residents and developers to share his vision. Ewing said there is no timetable to make final decisions on the project. Right now, he is focused on sharing ideas and getting feedback.